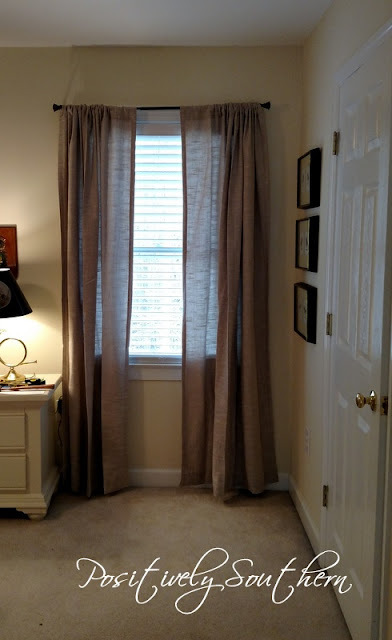 For what seems like forever I've searched for window treatments for much of our house. A few weeks ago I spied panels while at Pier 1 Imports, I thought they might work in the "never before seen" bonus room. They ended up being too short for that space. This totally flung a wrench into my goal of having the bonus room makeover started. But as luck would have it they turned out to be great in John's room. At first I tried hanging them just on the rod, they are after all rod pocket panels. Here is how that looked. So back to the store to pick up curtain rings. I would have liked to have had larger rings but they simply didn't look right on the rod. So smaller worked just fine! I did use a ruler to measure equal spacing for the rings. Mother with all her sewing ability believes she can make a french pleat out of these next time she visits! I promise...an iron was used in the hanging of these panels not that it looks like it! As most know, linen doesn't iron well. Maybe the longer they hang the wrinkles will fall out. Having window treatments now gives John's room a more polished look.